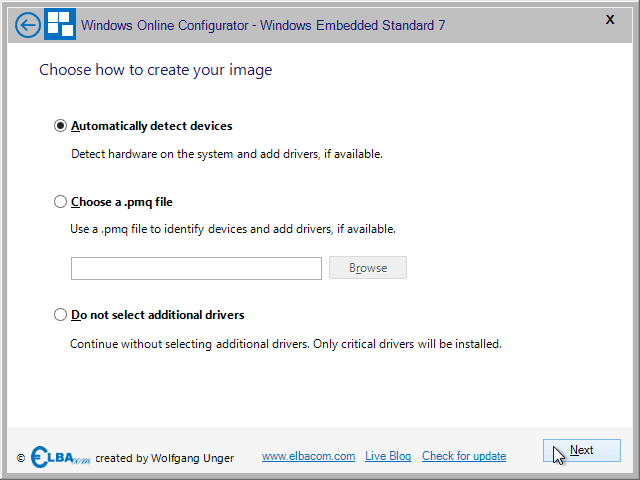 Windows Online Configurator allows you to your Windows Embedded images directly on your target hardware, by using an advanced setup experience. It allows you to fully customize Windows 10 IoT Enterprise 2016 LTSB, Windows 10 IoT Enterprise 2016 CBB, Windows 10 IoT Enterprise 2015 LTSB, Windows Embedded 8.1 Industry Pro and Windows Embedded POSReady 7 prior the installation and also enhanced the experience for Windows Embedded Standard 7 and Windows Embedded 8 Standard. 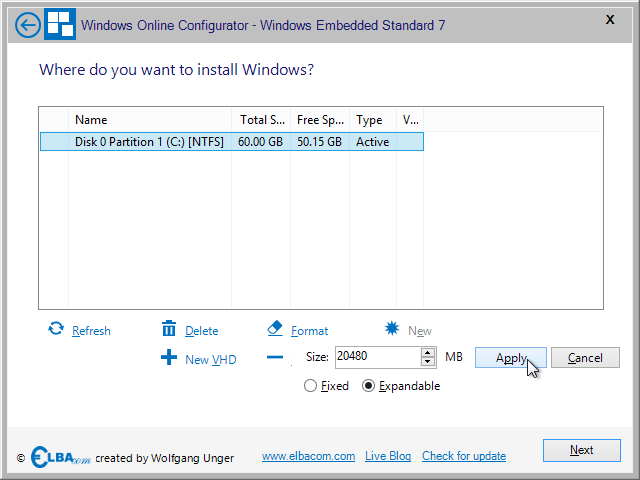 Windows Online Configurator provides an easy-to-use user interface that looks similar to the known Image Builder Wizard from Windows Embedded Standard 7. 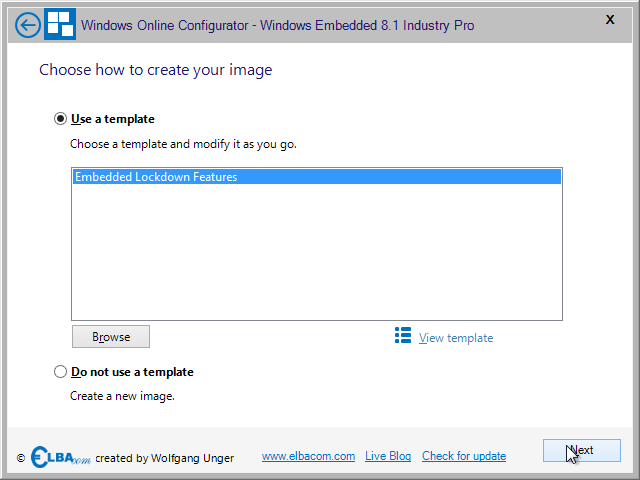 You only need a few clicks to build your Windows Embedded Standard 7, Windows Embedded POSReady 7 or Windows Embedded 8 Standard image. The tool will do all the needed work for you in the background. 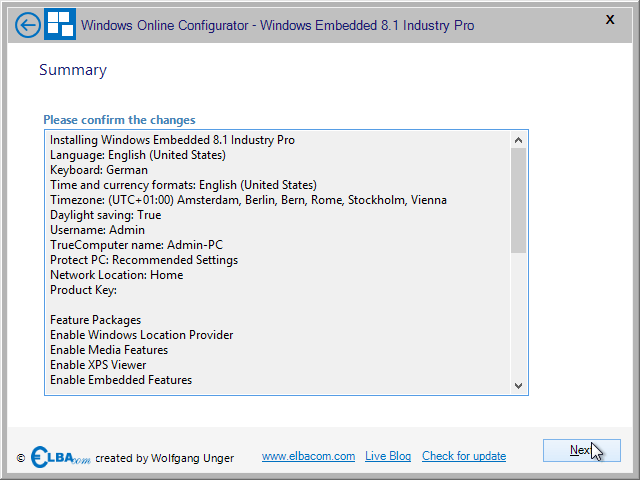 Windows Online Configurator allows you to fully customize Windows 10 IoT Enterprise 2016 LTSB, Windows 10 IoT Enterprise 2016 CBB, Windows 10 IoT Enterprise 2015 LTSB, Windows Embedded 8.1 Industry Pro and Windows Embedded POSReady 7 prior the installation. You can already add and remove feature packages before installing the system to your target machine! 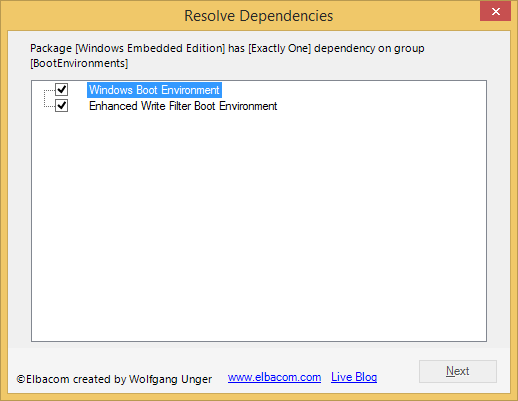 All required feature pack dependencies will be added automatically by Windows Online Configurator. The tool will also take car that the dependencies of the installed Windows Embedded system are fullfilled so you cannot remove important files that make the system unbootable. 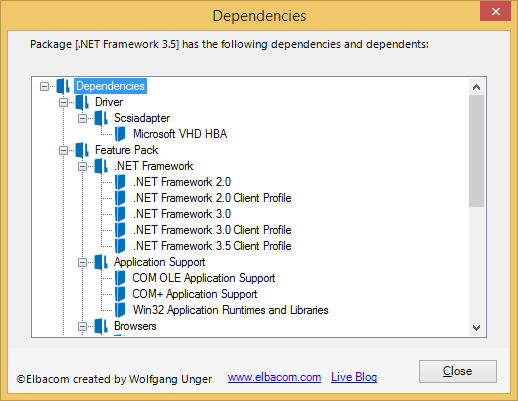 When running the “Dependency Check” Windows Online Configurator will also check for conflicts between feature packages and offers an easy way to resolve the conflicts by showing a specialized dialog with information about how to solve the conflict. 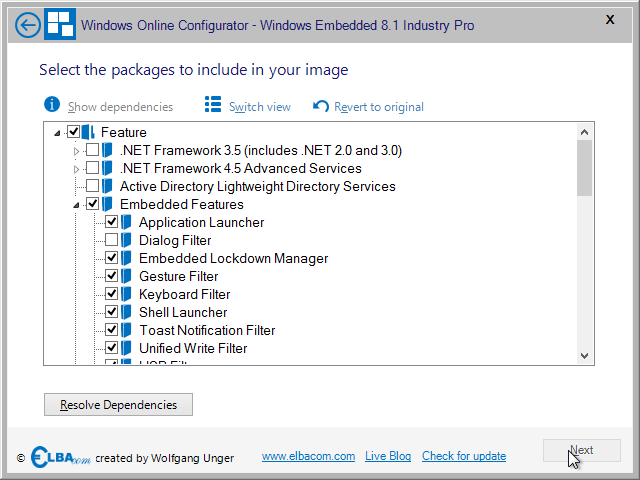 An unique feature of Windows Online Configurator is to show a complete list of all the dependencies of a specific component. 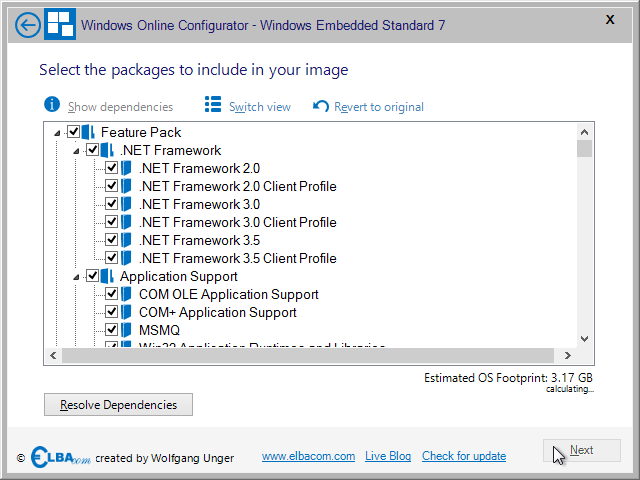 Windows Online Configurator will calculate the estimated OS footprint when selecting or deselecting feature packages. This will inform you how your current selection will impact on the operating systems size. 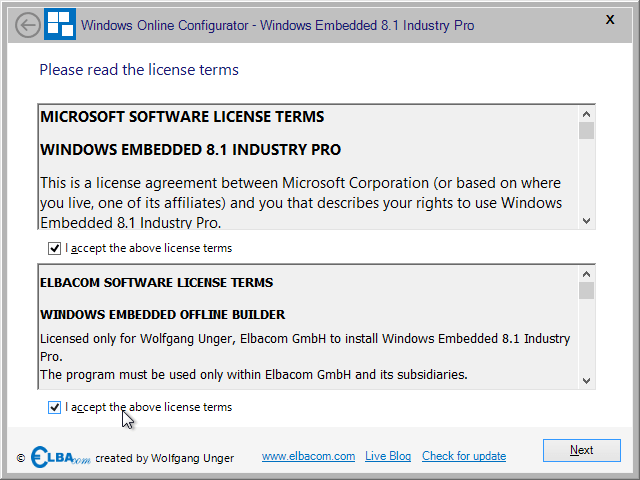 Windows Online Configurator supports building images for Windows Embedded Standard 7 and Windows Embedded POSReady 7, Windows Embedded 8 Standard and Windows Embedded 8.1 Industry Pro and Windows 10 IoT Enterprise 2016 LTSB, Windows 10 IoT Enterprise 2016 CBB, Windows 10 IoT Enterprise 2015 LTSB. It will detect which setup media is being used automatically. 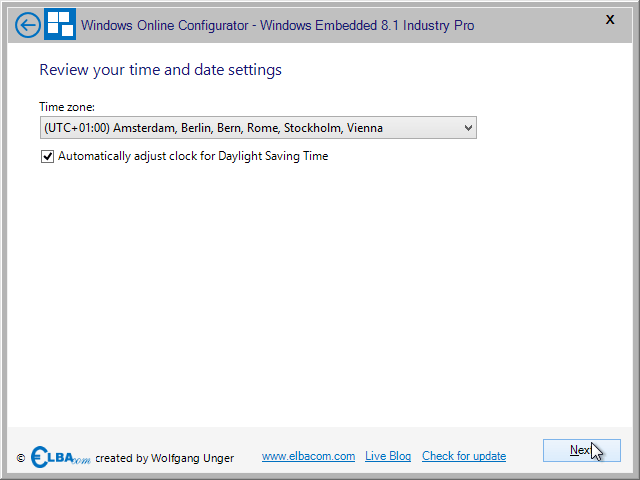 Windows Online Configurator allows you to completely configure your installation including the OOBE phase. When running the setup you can already specify the usernames, computername, product key, etc. So the resulting image is ready to use without additional configuration! Answer files created by Windows Online Configurator are 100% compatible to Image Configuration Editor or System Image Manager. Windows Online Configurator even includes suggested values of Feature Packages so there will be no warnings when loading the answer files in Image Configuration Editor! Windows Online Configurator offers an enhanced and faster setup experience. 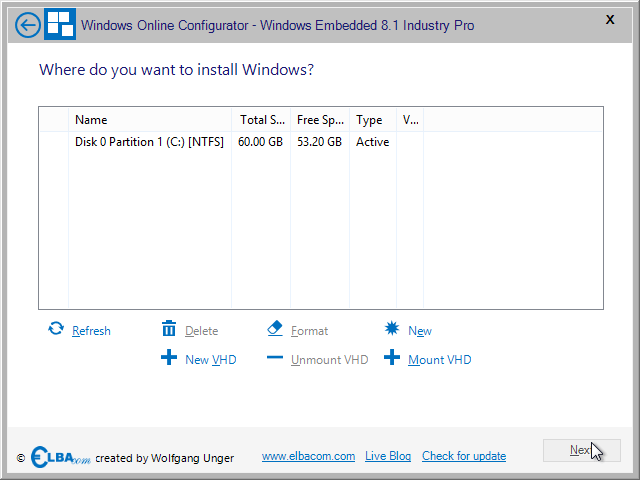 It includes many additional features compared to the original setup and allows full customization for Windows Embedded 8.1 Industry Pro and Windows Embedded POSReady 7. 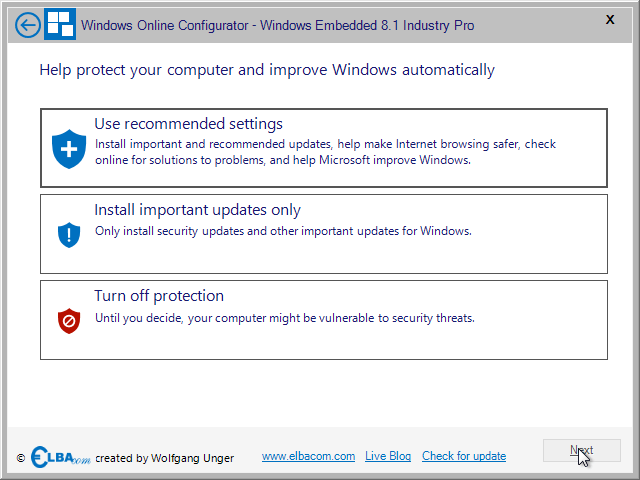 Windows Online Configurator offers the ability to check for new updates from within the tool. 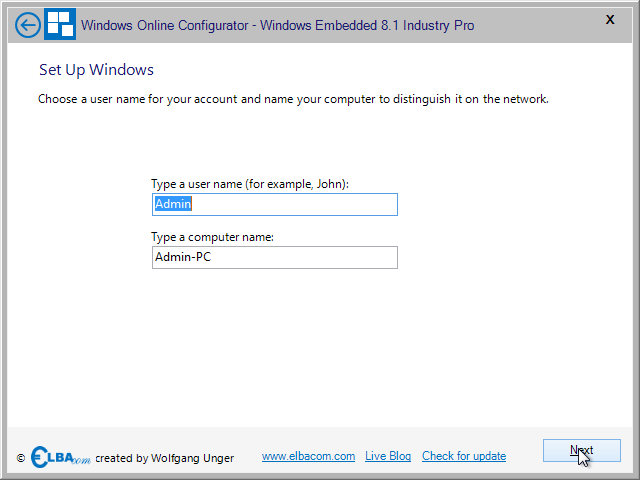 Windows Online Configurator is designed to run on your target device and allows you to install an embedded operating system from there. 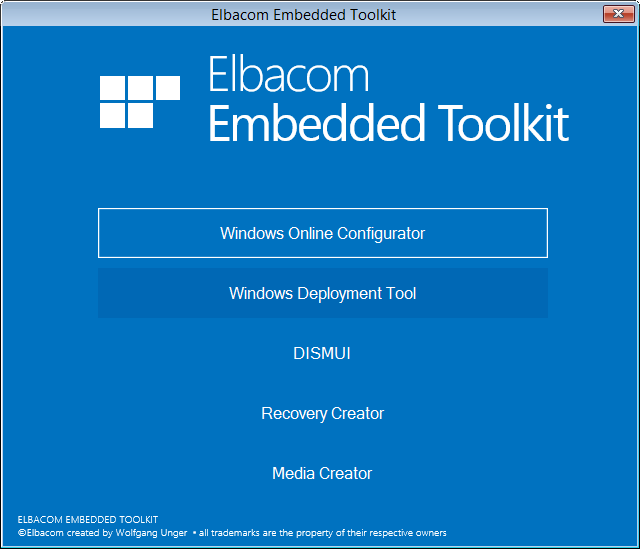 To start the installation of an embedded operating system, insert the setup media (IBW or OPK setup disc) into your target device and also insert the Elbacom Embedded Toolkit (USB or DVD). 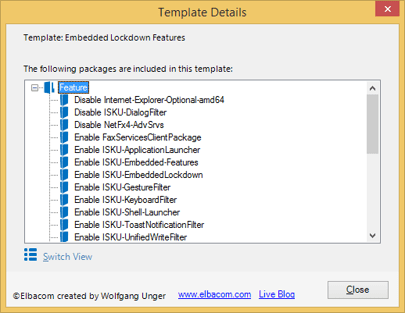 Then boot your target device from the Elbacom Embedded Toolkit. 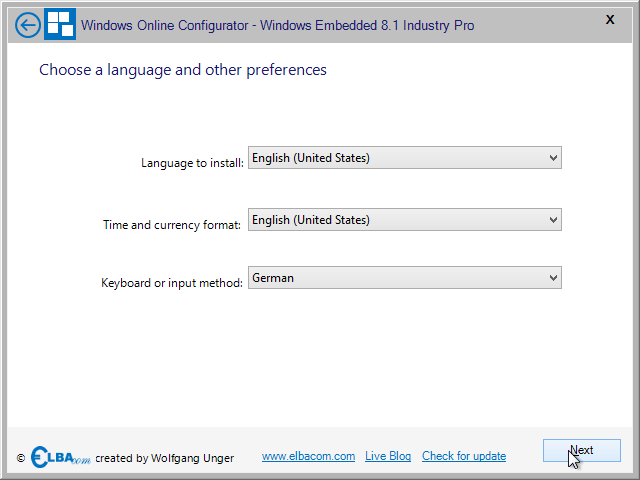 Select “Windows Online Configurator” from the Launcher. 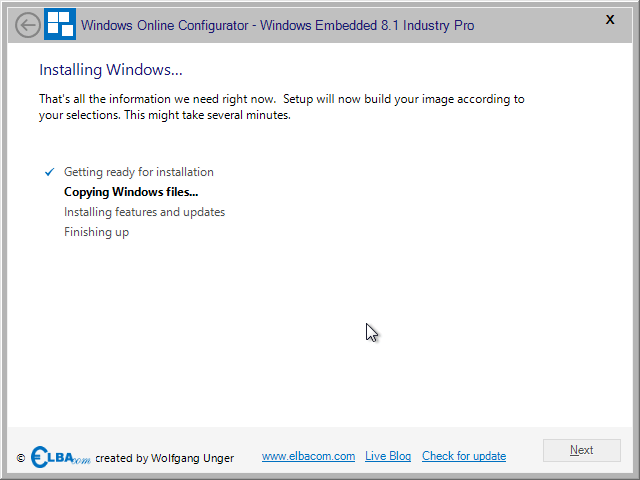 Windows Online Configurator will automatically find the setup media and will start the installation wizard. 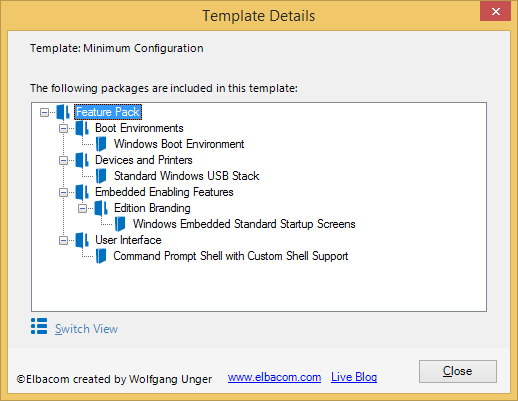 Depending on the operating system media, Windows Online Configurator will display various templates to choose from. 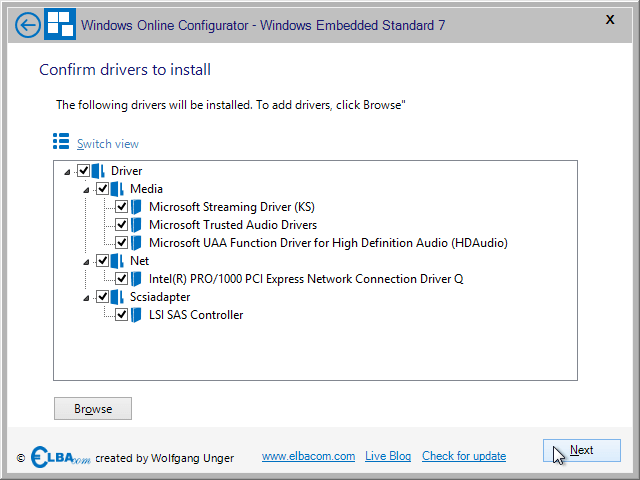 If you haven’t selected “Do not select additional drivers”, then Windows Online Configurator will try to find the required drivers automatically. Please enter the product key for the product you are installing. 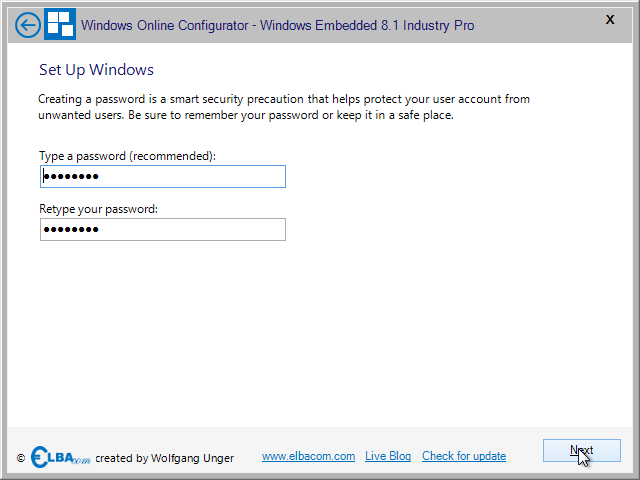 Windows Online Configurator will validate the key and display the result. Then click “Next”. 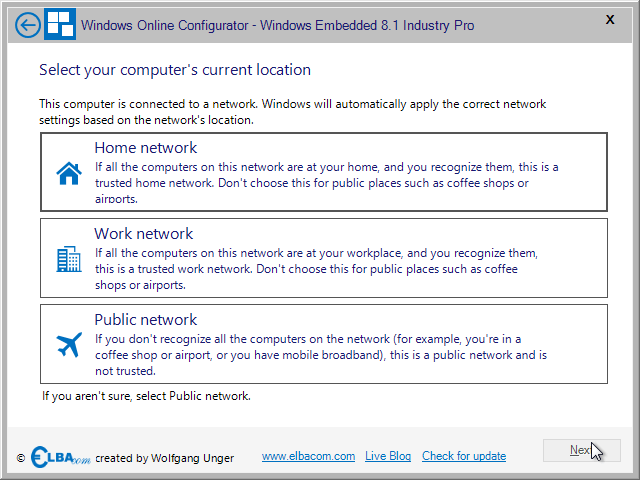 Windows Online Configurator will show you a summary of your configuration. Please check it and click “Next”. Windows Online Configurator will now build the Windows image according to you selections. Please wait for it to finish. 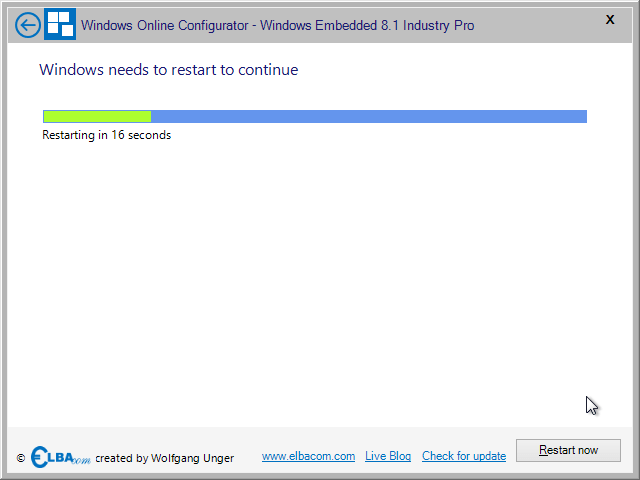 Once the setup finishes it will restart automatically after 20 seconds. You can initiate the reboot immediately by clicking “Restart now”.